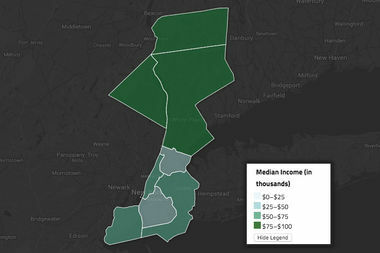 The Area Median Income is calculated using the incomes of New York City along with Westchester, Rockland and Putnam counties. AMI stands for Area Median Income. It's a number, released every year by the federal Department of Housing and Development, that represents the combined income of an average New York household. (In math, the median is the exact middle number in a group.) For a single person, the current AMI is $60,500. For a family of four, it's $86,300. AMI is used to determine the amount of subsidies a building developer can get in exchange for affordable units, the rent that a landlord can charge for those units, and the income requirements that New Yorkers who want to get into affordable units must meet. AMI is calculated using the incomes of residents in the five boroughs, along with Westchester, Putnam, and Rockland counties. Not everyone is a fan of this process. Some people, like Harlem State Sen. Bill Perkins, think that including the more affluent Hudson Valley counties in the calculation skews the numbers, putting affordable housing out of the reach of poorer residents. Putnam, Rockland and Westchster all have higher median household incomes than the five boroughs. But HUD argues that because AMI is tied to the legal rent landlords can charge, including the Hudson Valley counties in the calculation makes it viable for developers to offer affordable housing. "If AMI is too low, you might have expanded availablity but non-existent housing," said HUD spokesman Charles McNally. So how do I compare to the AMI? Use the tool below to find out what percentage of the AMI you make. And keep that number in mind the next time you come across an affordable housing lottery.